"This book should be required reading for anybody considering opening a retail store. It helped me formulate my idea and became my retail bible for my first years in business. As I read it, I began to highlight sections that I felt were most relevant, however, that meant highlighting almost every page and now that somewhat raggedy book is a luminous green on nearly every page." "There are so many things to think about when going into business. Schroeder has covered them all in Specialty Shop Retailing. It is truly a must–read for anyone considering opening a shop!" "An extremely detailed book for anyone interested in opening a retail business. This book follows every step from the very beginning stages through opening and any situation you could come up with after that." "It doesn′t matter if you′re just getting started or have been in the specialty store business for years, Schroeder′s intelligent advice is invaluable to anyone in the specialty store retail business. She has been there and done it . . . successfully! The best part is she knows how to tell the rest of us the secrets to her success in a friendly, understandable way with lots of usable ideas." 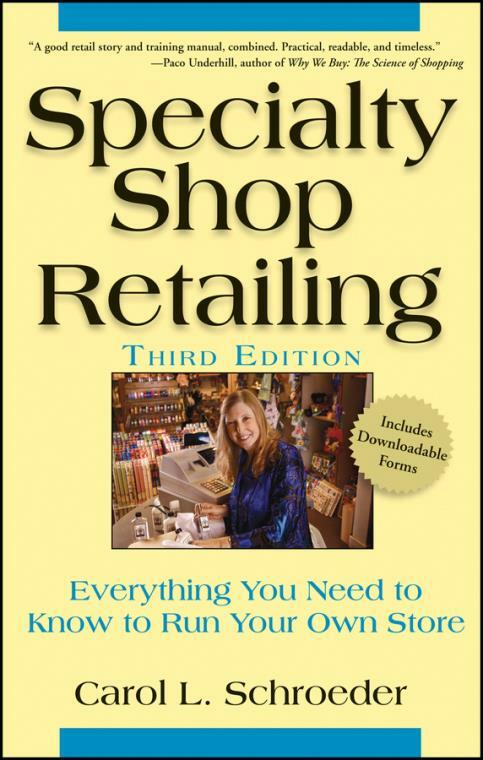 "Everything you wanted to know about specialty retailing you can learn right here . . . A must–read for all prospective owners and all key employees. Add your own creativity and fun, and you have the formula for success!" Finding Your Customers: Market Research. Starting Small or Staying Small. Writing a Successful Business Plan. Getting the Necessary Permits and Licenses. Chapter 2. Managing Your Store s Finances. Setting Up Your Sales System. Creating Budgets and Future Plans. Chapter 3. Successful Store Design. Updating Your Look by Remodeling. Welcome: The Storefront and Entranceway. A Different Kind of Overhead: Ceilings. Checking Out the Cash Wrap Area. Background Music for Shopping Pleasure. Restrooms, Offices and Other Backstage Needs. Chapter 4. Gathering the Goods: Merchandise Buying. Where to Look for Great Merchandise. Stretching Your Budget By Consignment. Higher Margins through Direct Importing. Buying for Displays and Promotion. Benefiting from Working with Sales Reps.
Establishing Your Store s Financial Credibility. Using Purchase Order Forms Efficiently. Chapter 5. Visual Merchandising: Displays that Sell. Check–in Time for New Arrivals. Getting the Goods on Display. Visual Merchandising in the Future. Chapter 6. Finding and Keeping Great Employees. Hiring for Special Job Functions. Appealing to a Shrinking Workforce. Where to Look for Good Employees. The How to Hire Guide. Government Forms for New Employees. Staff Training on Store Procedures. Your Store s Employee Handbook. The Importance of Flexible Scheduling. The Importance of Employee Evaluations. Saying Goodbye: The Exit Interview. Chapter 7. Customer Service Essentials. Motivating Employees to Give Great Service. Time to Shop: Setting Store Hours. Setting a Customer–Friendly Return Policy. For Customer Convenience and Comfort. Services that Exceed Customers Expectations. Added Sales through Wedding and Gift Registries. Hot Trend: Gift Cards and Gift Certificates. Special Service: Customer Orders and Holds. Chapter 8. Getting the Word Out: Advertising Your Shop. Tools for Targeting Your Market. Choosing the Best Media for the Money. Should You Use an Ad Agency?. Using Co–op to Stretch Your Budget. Welcome to the World of Print Advertising. Direct Mail: Making the Best Use of Your List. Broadcast Media: Radio and Television. Retailing Online: The Next Wave. Evaluating Your Advertising s Effectiveness. Advertising When Sales Are Down. Chapter 9. Using the Internet to Promote and Prosper. Establishing Your Home on the Web. Advertising Online: Web Site Essentials. Using E–mail for Customer Contact. Keeping in Touch with Staff: Internal E–mail. Bricks to Clicks: Selling Online. Choosing Your Approach to Online Sales. Better Service via the Web for In–store Customers. How to Draw Customers to Your Web Site. Chapter 10. Creative Promotion and Publicity. Alternative Ideas for Store Promotion. Catering to Consumers Through Collectors Clubs. Special Events to Attract Shoppers. Taking it On the Road: Events Outside the Store. Garnering Publicity and Good P.R..
Chapter 11. Beating the Big Box Stores. The Buy Local Call to Action. Turning the Tide on Big Box Development. What to do When Wal–Mart Comes to Town. Chapter 12. Good Works are Good Business. Charitable Donations: What and Where to Give. Selling Goods that Do Good. Museum and Hospital Shops: Retailers Who Serve. Giving Something Back to the Community. Taking a Stand: Community Leadership. Chapter 13. Managing During Tough Times. Insuring Against Crime, Disasters and Other Crises. Curtailing Shoplifting and Employee Theft. Fires, Storms and Natural Catastrophes. What to Do When Disaster Strikes. When You Lose Your Lease. Coping with Vandalism and Graffiti. When You re in Financial Trouble. Chapter 14. Improving Sales and Profitability. Growing Sales Through Relationship Marketing. Targeting Luxury Shoppers and Corporate Sales. Markup Can Make Up Your Margins. Expenses Down = Profits Up. The Dangers of Too Much Inventory. Chapter 15. Looking to the Future. Riding the Wave of Success. If You Decide to Grow Your Business. Moving On: Selling or Closing Your Store. Life Planning Issues for Shopkeepers. The Outlook for Retailing is Bright. Carol L. Schroeder is the co–owner of Orange Tree Imports, a successful gift and kitchenware store in Madison, Wisconsin. She has over three decades of experience in specialty shop retailing, beginning with the Scandinavian furniture store she and her husband Dean transformed into a unique shop featuring gourmet products, toys, seasonal decor, foods, jewelry, stationery, soaps, and more. Orange Tree Imports was chosen as one of five Millennium Retailers in the United States by Gifts and Decorative Accessories magazine and was voted "Best in Business" byIn Business magazine.